Some time ago I returned to Hatfield after an absence of forty years. I decided to take a look at the town where I was born and grew up and find out how it had changed in the intervening years. Hatfield New Town was already an embryonic reality before I left. Living close to another New Town I was well aware that there would be substantial alterations. Emerging from a smaller, less pretentious railway station I noticed at once that the road outside swept off southwards at an unfamiliar angle cutting off the town from this direction. How pleasant, I thought that traffic no longer flows through the centre of the town. I crossed the road and entered the park. The huge wrought iron gates looked more forbidding than I remembered them. I paid my admission fee to a disinterested cashier in a little wooden kiosk set uncomfortably in the middle of the wide drive. Passing the time of day had been all that was required when I was a child. The viaduct bridge above Park Street was reassuringly unchanged. My cousin Denis and his friend Greenwood Cull were banned from the park for a year for walking across its parapet – Oh the foolhardiness of youth! The chimney down which generations of Hatfield youth had aimed stones had been blocked. Central heating had at last relieved the householder of this torment. The North Front looked manicured, with another of those wooden kiosks set incongruously at one end. This had never been the ‘real’ park to us. That lay beyond The Avenue, now looking a shadow of its former grandeur. It appeared to be overgrown and deserted. I missed The Tank. It seems a great pity that it is not possible to find some way of leaving it on display in situ instead of being incarcerated in the Bovingdon Tank Museum. The Lion Oak continues to flourish (“will it still be alive I wonder when the next Domesday Book is written”). The estate yards are cleared of the clutter of carts and farm implements, and the work horses have gone. The livery stables now house the usual exhibitions, gift shops and restaurants associated with stately homes open to the public. After some refreshment I enjoyed wandering through the gardens which were in fine shape. When I was a child they were rather overgrown and neglected most of the gardeners being engaged on work considered more important during the war and the immediate post-war years. Thomas Stevens. the author’s grandfather, outside his home in Park Street. He was afimilar sight in Old Hatfield making his way to Glebeland allotments. Note the gates of” the Park Gate Chapel military establishment of the nineteenth century and the square with its cottage gardens was always a pleasant oasis amid the clustered houses of the town. We children would run through the square and round the corner to Topsy’s sweet shop. No matter that during the war sweets were rationed and the two or three jars on the shelf never varied. We usually managed to find something – coupons could be spent in quarters and we made our purchases last. There were also a number of ‘sweet’ items which escaped the rationing. I returned to the church. Guide boards were being placed around the building by a taciturn ‘custodian’. There were few signs of a warm Christian fellowship here. The church used to be a hive of activity years ago. The Rector and Curates were always around. The Verger, Willie Hall, scrubbed and polished the diamond tiles in the aisle until they shone. He was far more informative than those erudite but impersonal boards and could be prevailed upon to lead an expedition up the church tower to see the bells, the clock, the carillon and of course the view from the top. After the war the carillon was repaired and sang out its different song for each day every three hours, albeit with some hesitation when it ‘stuck’ momentarily. We knew that when the three o’clock tune began we only had a short time in school before ‘home time’. Fore Street had always been fashionable, and its class conscious pretentions have spread downwards as the few remaining shops have disappeared. There were still a number of shops at the bottom of Fore Street when I was a child. Butler the butcher’s shop is now a private house with its row of hooks now painted while as an architectural feature. I can remember going down the steps into Hankin’s shoe shop to be fitted with a pair of black patent leather shoes. I was immensely proud of those shoes which were the envy of my friends. The truth was that they were the only pair of shoes in my size and far more than my mother could really afford. Cox the chemist still had a shop there. We rarely went inside but occasionally we children would venture in to buy Victory V’s when we had run out of sweet coupons. Drury Brothers was a big dark store at the bottom of the street. There were racks of heavy duty clothing and boots like deep caverns. We were fitted out with stout raincoats, sou-westers and wellington boots here. The transformation below Fore Street is more radical and I was surprised to find little remained of what was once there. The new Salisbury Square is situated where once a row of shops bordered the Great North Road here known as Brewery Hill in honour of the large brewery, whose buildings still stood behind the shops. At the bottom of the hill the road swung round into the tree-lined Broadway. Brewery Hill was the busiest part of the town with a full range of good shops, a garage, two banks and a clutch of public houses (as a brewery town Hatfield was well endowed with these). There was even a large International store. What has happened to this part of Hatfield? With the traffic no longer a hazard I expected to find a pleasanter shopping street. Instead, it appears the iniquitous bulldozers moved in, razing most of the area to the ground before creating a New Town style square complete with central garden and modelled it on, it would appear! Tunbridge Wells. One thing seems to have been misunderstood; Hatfield was never remotely like Tunbridge Wells. It was an unpretentious little town; its population drawn from every social strata. It was not super-smart, in fact in places it was decidedly tatty, but it was alive. It was a busy place. During the time I was in Salisbury Square I saw just five people the town was dead. It looked nice, I preferred it as it was. I am well aware that the superstores have drained the life blood from many town centres. Existing shops struggle to survive. In Old Hatfield the shops were not even given the chance to fight – bulldozed out of existence to be replaced by an ostentatious edifice without a heart. To return to my visit. I found far less change in Church Street. My grandmother’s shop on the corner, now Simmons, was much as it always had been as was the shop on the opposite corner where the boys used to get their hair cut. When Grandma Palmer owned the shop it was a general grocery store. My mother used to relate how on Saturdays she made up the cone bags from the blue and brown ‘sugar’ paper. My grandmother made her own ice cream which was very popular. One of her best customers for this was a lovely black dog from the Dray Horse public house who used to come to the shop with a penny in his mouth for his ice. Unfortunately, some soldiers who were in a camp nearby, took a fancy to this intelligent animal and when they left town the dog was ‘enlisted’ as a mascot. Daisy Gray’s shop stood where the colonnaded Broadway now stands. How we loved Daisy Gray’s. Not only did she sell quality toys and stationery (we used to buy our pen nibs from her at a halfpenny each), but there was a window full of pocket money toys to which we gravitated deciding in advance what our next Saturday pennies would buy. Many of the items in that window are now much prized as collectors’ items particularly the lead soldiers. I still have a few. Beyond Salisbury Square and The Broadway, the area has been so extensively re-ordered that it was difficult even to visualise it as it was. Batterdale seemed to have disappeared completely and only the distinctive facade of the old Post Office made it possible to locate the course of the old North Road. I particularly wanted to look at the development of Park Street. My paternal grandfather had owned the former manse of the Park Street Chapel. At the time he lived there only the burial ground remained. Granddad kept chickens there and his pet tortoise roamed at will. We used to pick bunches of the colourful Chinese lantern flowers which grew wild there. Park Street used to consist of a number of small properties, a few shops and some yards of what can only be described as hovels. The inhabitants of these were, I believe, descendants of the Irish navvies who had arrived in the area during the construction of the railway. They had a reputation, justifiable or not I cannot tell, for hard drinking and violence. Strange then that those yards have been replaced by desirable Mews houses presumably for commuters using the same railway. I felt more at ease with the redevelopment of Park Street. The areas that have been demolished were beyond redemption and of little historical interest. (The Chapel had been demolished in the 1930s). The development was pleasant, reflecting the configuration of the earlier buildings. It just seemed a pity that nobody was at home. How interesting too, that the street has once more become the route to Hertford. Only Arm and Sword yard remained a no man’s land as though forgotten by everyone and not quite fitting in to the scheme of things. It was time to go; time too to collect my thoughts on the Hatfield of today. It’s a smart, almost pristine place these days. The dust, the traffic and the shabby buildings have all disappeared. However so have the trees in the old Broadway, the shoppers, the chatterers and the children. Gone too are the ghosts of the past. Miss White in her long black petticoats and black straw hat giving out tracts (pamphlets), by the One Bell Jim Smith striding down from the station with his trolley full of fish boxes. Hollier’s milk float making its way down Fore Street, the horse reluctant to stand on the steep hill. 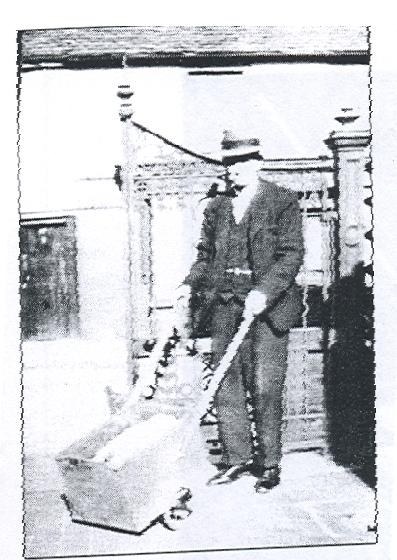 My grandfather with his little cart collecting free manure for his precious allotment. He spent much of his time fussing over his near perfect plot and dispensing words of gardening wisdom to the other allotment holders. I feel Old Hatfield has been unfortunate. Had Ebenezer Howard chosen another site for his Garden City there would probably never have been a New Town. Hatfield itself was never an ideal site, having no obvious centre, but it was a convenient satellite of Welwyn Garden City providing much of the low cost housing. Had the original New Town beyond Tingey’s Corner been given a different name Wellfield perhaps or Birchwood, the old town might have been left in peace as a separate entity. Had the planners not felt the need to bring balance to the New Town by creating a smart area in keeping with the town’s general tenor the bulldozers might never have been allowed to do their destructive worst? I find myself recalling the saying ‘A house is made with hands, a home is made with hearts’. Smart buildings are no substitute for a living community. Sadly I cannot see how Old Hatfield can live again. This page was added on 05/11/2010. Joy, by any chance were you once Joy Rolfe? I remember Jim Doyle and his horse Sally. We went out everyday in the school holidays to give her a pat while she ate the grass on the verge. This was in the 50’s and early 60’s so I hope I have got that correct. He used to deliver to Hatfield Garden Village where we lived in Green Lanes. Dr. Hutchings was our doctor although to a small child he seemed very gruff. I agree that it is sad to see what happened to the Old Town, but this tale is a good illustration of the tenet – “Never go back”. I often go back to the town of my childhood because my brothers and sisters still live there but it is a similar story. My old school is now a Tesco, the playground being the car park. The village High Street is under protection with the whole frontage Grade 2 listed, so Elcoates sweet shop still has the sign over the door – but it’s a private house now. The great Elm by the duckpond is gone, victim of Elm disease. The blacksmith’s shop on The Green is an “Arts” centre. But – had my great-great grandfather gone back in 1952 I have no doubt that he’d have been upset at all the changes, closed shops and new development that he found. It’s just life, the way it is. My Dad Jim Doyle was the Hollier’s Milkman with the horse and cart delivering milk. He had two horses, Sally and later replaced with Queenie. I often went with him and used to take him his bacon sandwich. Queenie liked stopping outside a house half way down Fore Street where the lady used to come out and give her sugar lumps! This was opposite Dr Hutchings house and surgery. We lived at 6 Park Street. I went to Countess Anne School as did my sister. This has opened up many memories that come flooding back along with tears. Born in Hatfield and married to a Hatfield girl Suzanne Warsaw. We lived on Fore St. number 17 .Leaving was not our idea our two children had been born in the house. If it had been up to us I’m sure we would still be their! The home of Health Supply Hatfield. Sue’s fathers health food manufacturing plant at the rear. It was next to Butler’s slaughter house. By the way it was not Willy Hall who polished the church floors it was the verger who took over from him Willie always washed the foors on Fridays. Sue an I use to clean the church silver on Fridays and always kidded him about the floors. He was one of a kind and enjoyed his next job as gate keeper at theFore St . the entrance to the park. Thanks for the momories it is all we have left of a great place and time! Old Hatfield has now changed much, all in the name of progress!!! Reading your artical made me think of my childhood.I lived in Salisbury Sq.and moved to Batterdale next to the fire station and was there until the bull dozer came and we had to move to Hilltop South Hatfield. All the shop keepers knew me in old Hatfield it was a lovely friendly place.I was born in Hatfield park as my dad was a gardener for Lord Salisbury sadly all my family have gone as like all the wonderful things in old Hatfield. This one also brought a tear to my eye it reflects my feelings.